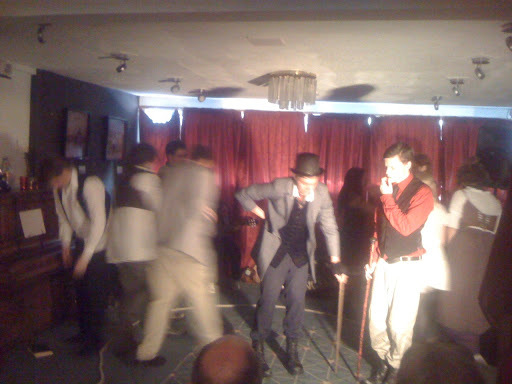 From five fresh student playwrights (http://theatre.susu.org/sh​owpage.php?id=121), comes a mesmerising spectacle of sinister slapstick theatre. we are delighted to welcome this local group, on their way to the Edinburgh Fringe festival. The Spectacular Tales of Grinburrell is a peep into the dishevelled lives of a band of vagabond travelling raconteurs, selling their bizarre fables and spooky myths to audiences young and old. The story weaves five enchanting tales around the mismatched pack of nomads, as they guide their captivated audience through what is a riotous and spellbinding mash of physical theatre, mime, song and story. Fit to burst with humour, enigmatic characters and chaos, The Spectacular Tales of Grinburrell is an impressive piece of original theatre.